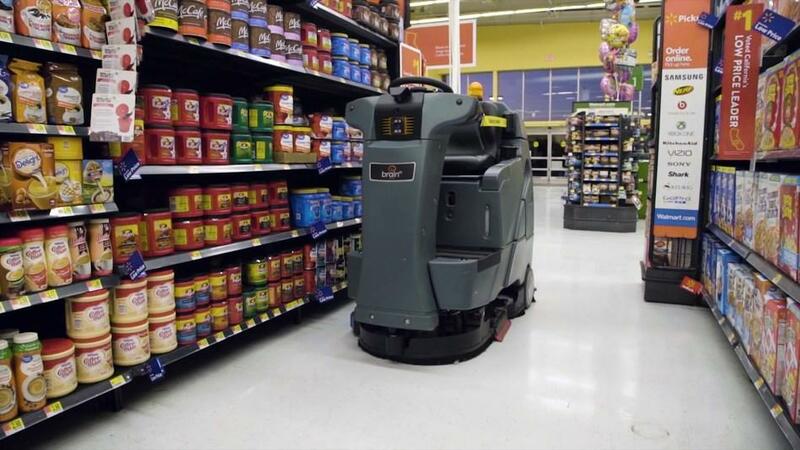 Make way for robot janitors, Walmart shoppers. The world's largest retailer plans to have 360 robot mops scrubbing floors at some of its stores by the end of January, Walmart and artificial-intelligence provider Brain Corp., said Monday in a joint statement. The autonomous machines are equipped with sensors to scan for people and obstacles nearby, and can clean up even with customers about, according to Brain Corp., a San Diego tech start up. The floor scrubbers need a person to map an initial training route, but can then follow the route on their own. Walmart said the robots would free up its workers from redundant work — and presumably spend more attention on customer needs. "BrainOS is a powerful tool in helping our associates complete repetitive tasks so they can focus on other tasks within role and spend more time serving customers," John Crecelius, Walmart's VP of central operations, said of Brain's software. The retailer is already using technology to automate tasks such as scanning shelves for out-of-stock items, incorrect prices and wrong or missing labels. Walmart is not alone among retailers in using technology in an attempt to gain an upper hand on the competition. Amazon, for instance, is using artificial intelligence to rid stores of cashiers and checkout lines in Seattle and Chicago.